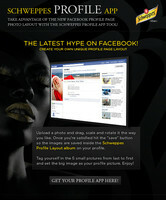 Schweppes launches Schweppes Profile App on Facebook. Recently Facebook released new improvements to the Facebook profile which makes it even easier for you to tell your story and learn about your friends. Shortly after the release a French artist took advantage of the new profile design to express himself. Many other creative minds have played around with their profiles. 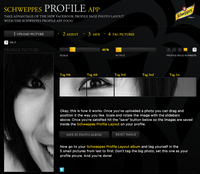 This inspired Schweppes to develop the Schweppes Profile App on Facebook, which helps anybody who doesn’t have Photoshop skills and much time to get a great new profile as well. The Schweppes Profile App is another way to honour those consumers who have contributed in making what the Schweppes brand stands for today. The app is perfect for those people who have strong personalities, are self-assured and really want to express themselves in a creative and sophisticated way. Schweppes teamed up with the social media marketing agency Super Social, who is responsible for the concept and development of the Schweppes Profile App.